The power of one person, in the right place, at the right time, cannot be underestimated. Tish McDaniel, a range conservation scientist for CEHMM (The Center of Excellence) and a recent recipient of the Hamerstrom Award, is a prime example. She is the first to admit that at times it was like pushing against a brick wall. But her achievements are astounding. Tish grew up in Clovis, New Mexico, and became interested in playas at an early age — so much so, that she later developed a playa curriculum for school children, which she ran for more than six years. 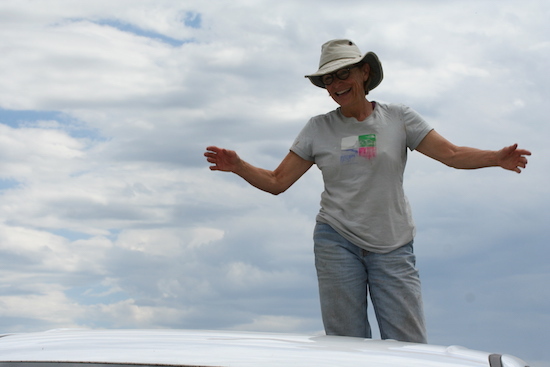 As The Nature Conservancy’s Eastern New Mexico Shortgrass Prairie Coordinator, she applied for and received a PLJV Capacity Grant, which helped to expand her playa and grassland conservation work in the region. As a result of her efforts, over 600,000 acres of land in a four-county area has undergone some sort of restoration or protection using NRCS funds. She worked with the local NRCS working group in Curry County, and then in neighboring counties, convincing them to use two percent of their EQIP funds for playa and Lesser Prairie-Chicken conservation. For ten years, these counties did that, and then some, believing Tish when she said the end result would be good for producers, as well as wildlife. Her work in Eastern New Mexico has not only changed the landscape but also people’s beliefs and attitudes about playas. Earlier this year, the City of Clovis decided to devote a sizable portion of its development funds to playa restoration to help support recharge to the Ogallala Aquifer, the source of the city’s drinking water. Because of Tish, the city commissioners now understand that by protecting and restoring playas, they are protecting their future. Photo courtesy of Betty Williamson.